Details of NBSTSA’s new late fee policy are available here. The mission of the NBSTSA is to provide professional certification of surgical technologists (CST) and surgical first assistants (CSFA), thus promoting quality patient care in the surgical setting. Study anytime, anywhere. 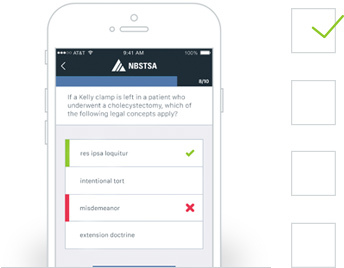 Download the official test prep app for the CST and CSFA examinations. Practice before the big day. Sign up for online CST and CSFA practice examinations through PSI. Certification as a Surgical Technologist or Surgical First Assistant demonstrates that the individual meets the national standard for knowledge that underlies surgical technologist and surgical first assistance practice. Certified individuals possess mastery of a broad range of skills related to surgical procedures, aseptic technique and patient care. Because certification is voluntary, the choice to become certified exhibits pride in the profession, the desire to be recognized for mastery of scientific principles, as well as an ongoing commitment to quality patient care. Certification is a means for upward mobility, a condition for employment, a route to higher pay, and a source of recognition nationwide. Approved candidates who take and pass the CST examination are authorized to use the initials CST as long as they maintain certification currency. Approved candidates who take and pass the CSFA examination are authorized to use the initials CSFA as long as they maintain certification currency. CST’s certified prior to September 1, 1977, may voluntarily comply with The National Board of Surgical Technology and Surgical Assisting (NBSTSA), formerly the LCC-ST ’s continuing education or re-examination requirements.